During the month of August, we Celebrate Freedom!™ in Pigeon Forge as we say thank you to America’s military and first responders. Throughout August, participating businesses in Pigeon Forge offer discounts to active and veteran military personnel, police, firefighters, paramedics and other first responders. 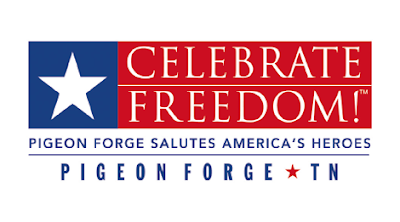 Below is a list of a few place that will be honoring the discounts just stop by the Pigeon Forge Welcome Center (traffic light #0) and show your ID to receive the Celebrate Freedom benefits. Alamo Steakhouse 3050 Parkway, Pigeon Forge, TN 37863 865-908-9998 15% off lunch (11am-3pm). Bennett’s Pit Bar-B-Que 2910 Parkway, Pigeon Forge, TN 37863 865-429-2200 20% off breakfast (8am-11am). Big Daddy’s Pizzeria 3053 Parkway, Pigeon Forge, TN 37863 865-429-7171 15% off all day (11am-close). Corky’s Ribs & BBQ 3584 Parkway, Pigeon Forge, TN 37863 865-453-7427 $5 off $25 or more purchase. Not valid with any other offers. Flapjacks Pancake Cabin 2734 Parkway, Pigeon Forge, TN 37863 865-908-6115 $5 off $25 or more purchase. Not valid with any other offers. Frizzle Chicken Pancake Coop 2785 Parkway, Pigeon Forge, TN 37863 865-774-7707 10% off total check. Golden Corral 3610 Parkway, Pigeon Forge, TN 37863 865-453-1827 $5 off $25 or more purchase. Not valid with any other offers. Huck Finn’s Catfish 3330 Parkway, Pigeon Forge, TN 37863 865-429-3353 Complimentary order of fried pickles appetizer. Mad Dog’s Creamery 3048 Parkway, Pigeon Forge, TN 37863 865-774-5558 15% off all day. Marco’s Pizza 2656 Parkway, Ste. 1, Pigeon Forge, TN 37863 865-277-6361 20% off regular menu price (not valid for delivery orders). Reagan's House of Pancakes 2820 Parkway, Pigeon Forge, TN 37863 865-428-0652 20% off. Reagan’s House of Pancakes 3516 Parkway, Pigeon Forge, TN 37863 865-453-4600 20% off. Shoney's North 3164 Parkway, Pigeon Forge, TN 37863 865-453-1806 15% off all food and beverages for military personnel and veterans. Shoney’s South 3885 Parkway, Pigeon Forge, TN 37863 865-428-3440 15% off all food and beverages for military personnel and veterans. The Great Smoky Mountain Wheel 131 The Island Drive, Pigeon Forge, TN 37863 865-286-0119 $7 Wheel admission per person for military member and immediate family (spouse and children living in household). Ole Smoky Moonshine 131 The Island Drive, Ste. 9115, Pigeon Forge, TN 37863 865-436-6995 15% off. Outdoor Gravity Park 203 Sugar Hollow Road, Pigeon Forge, TN 37863 865-366-2687 $17 per roll. Titanic Museum Attraction 2134 Parkway, Pigeon Forge, TN 37863 1-800-381-7670 Complimentary admission for all veterans, active duty military, emergency response personnel, law enforcement, and firefighters. Guest must show valid agency ID to qualify. All others in party, regular admission rates apply. Reservations are recommended. 1-800-381-7670, mention: ‘Celebrate Freedom 2018.’ Complimentary admission valid August 1-31, 2018 with agency ID only. WonderWorks 100 Music Road, Pigeon Forge, TN 37863 865-868-1800 $5 off All Access admission at WonderWorks indoor amusement park. $5.00 off adult ticket price. Country Tonite Theatre 129 Showplace Boulevard, Pigeon Forge, TN 37863 865-453-2003 Half price tickets to Country Tonite show. Valid for all adults in party. *Not valid for special concerts. The Grand Majestic Theater 2330 Parkway, Pigeon Forge, TN 37863 865-774-7777 Buy one show or dinner show – get one free with proper ID. Hatfield & McCoy Dinner Feud 119 Music Road, Pigeon Forge, TN 37863 1-800-985-5494; 865-908-7469 $5.00 off adult ticket price. Magic Beyond Belief 2046 Parkway, Pigeon Forge, TN 37863 1-800-768-1170; 865-428-7469 $5.00 off adult ticket price. Smoky Mountain Opry 2046 Parkway, Pigeon Forge, TN 37863 865-428-7469 $5.00 off adult ticket price. Angel’s Dolls, Toys & Gifts 2736 Teaster Lane, Pigeon Forge, TN 37863 865-908-6688 20% off, except final sale items. Big Dog Sportswear 2850 Parkway, Ste. 1, Pigeon Forge, TN 37863 865-428-6832 “Heroes Discount” – 10% off any purchase. Board & Brush 513 Wears Valley Road, Pigeon Forge, TN 37863 865-415-5659 $20.00 off a regular priced workshop (re. price $65.00). **Guest must email bbseviervilletn@gmail.com for the coupon code before registering online. Lid’l Dolly’s Factory Store 2870 Parkway, Pigeon Forge, TN 37863 865-429-4867 20% off – excludes clearance. Patriot Peddler 131 Island Drive, Ste. 3103, Pigeon Forge, TN 37863 865-216-2359 10% off to all past and present U.S. military and first responders. Puzzled on the Island 131 Island Drive, Ste. 4103, Pigeon Forge, TN 37863 865-366-1188 20% off all regular priced items. Unlimited with Military, Fire, Police or EMS ID. Smoky Mountain Gourmet Popcorn 2530 Parkway, Ste. 25, Pigeon Forge, TN 37863 865-428-6880 15% discount; may not be combined with other discount bands or coupons. The Veterans Store 2850 Parkway, Ste. 23, Pigeon Forge, TN 37863 865-428-1378 10% discount. 20% off spa services. Not valid with any other promotions or discounts. Must mention Celebrate Freedom discount. Please read carefully. Offers from participating businesses vary. Check with business for exact offer details. Discounts valid August 1 – 31, 2018 only, unless otherwise stated in offer.